My lettuce has germinated and is about 1 1/2 inches tall (in a veg. 6 pk. container). It seems to have stopped growing for the last 2 weeks and I'm not sure whether to transplant it into a larger container as individual plants or what to do? Any suggestions? You definitely have to transplant your salad seedlings. They are running out of space and nutrients. To develop a salad head they need more space and nutrients. You can either transplant into individual pots, window-boxes, grow bags or into the open ground. Separate your seedlings carefully. Try to leave as much root intact as possible. Fill a pot with good quality potting soil and push a hole into the middle. If you plant into window-boxes or grow-bags leave 10-12 inches between the seedlings depending on lettuce variety. Insert the roots of the seedling and firm the soil carefully around it. Water in well until the water runs out at the bottom of the pot. Feed and water the plants regularly. You can add a general purpose liquid feed to the water about every ten days. Prepare the ground: the soil should be loose and crumbly. Add some well rotten compost and a general purpose organic fertilizer. Plant the seedlings in rows about 12-18 inches apart. Leave 10-12 inches in between the individual plants. Keep the lettuce well watered in dry weather to avoid bolting. Don't forget about slug control. 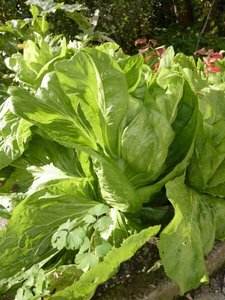 Check out this page for more tips on growing lettuce.